Peniche Surf Lodge1 and 2 offer Cheap luxury accommodation offering surfing lessons ,professional surf coaching and equipment hire , a homely beach side property in Peniche ,Owned and run by a family who love to surf ,travel and to meet new people from all over the world , everyone will feel at home in our comfortable,friendly and relaxed lodge, where you too can meet new friends we have 2 lodges one a little quieter so please request.We drive to the golden sand beaches everyday looking for the best surf conditions make a cosy beach camp by a cafe with internet and surf together for the day, we are also enjoying gorgeous scenery, historic villages ,beautiful sunsets,come join us experience Europes most consistent waves. We are situated a stone's throw from Portugal's spectacular Atlantic coast .Minutes from the 1st class wave spot Supertubos . Home to the Rip Curl Pro ,every October ,also walking distance to the Harbour, other beaches ,supermarkets cafe shops and banks . Peniche Surf Lodge is conveniently placed in Peniche town,which as well as consistent surf,and stunning beaches, there are many other activities and attractions ,the town is known for its fishing port and lace making skills ,there is a Mariner ,where you can catch a ferry to the beautiful Berlingas Islands, in the harbour are also many restaurants serving fresh traditional Portuguese cuisine at very low prices, a weekly market selling fresh local produce,the lodge is by 3 large supermarkets,with restaurants, shops ,bars within easy walking distance. For Surfing we can provide equipment and lessons for all levels with a qualified instructor and also professional surf coaching with video analysis, There is a surf spot Papoa ,a semi reef opposite the Lodge , 200m down the road is The Bay a 3 km long golden sand and dune beach with surf all along for all levels of surfing ability and perfect for bathing ,we are also walking distance to Supertubos and Mohle Leste ,No.1 wave spot ,home to Rip Curl Pro.Experience the perfect Barrel!! We also offer to take you on surf surfaris up and down the coast,offer coaching,take photos and video footage to give analysis and edit a movie of your trip, We can provide airport transfers if needed ,please enquire about these in advance for cost and availability. Peniche is a very festive town throughout the year,there are lots of special events happening in and around the town,we can inform you of whats on and where to go . Back at the Lodge,we have a Free computer for your use Free wifi, cable TV and a selection of Dvds ,board games and books all for your entertainment. Free daily rides to the beach and back when hiring equipment . Please NOTE: We are not at the always Lodge times vary according to season ,we have a key box please request the code . We will now open all year round ,NOTE: October to March you will still have Sun and even better Surf and cheaper accommodation we offer discount on your bed if you hire equipment from us. Very nice place, nice people. Claire and Duncan were very friendly, open and helpful hosts. Their little trips to the beach were a highlight of our stay here. 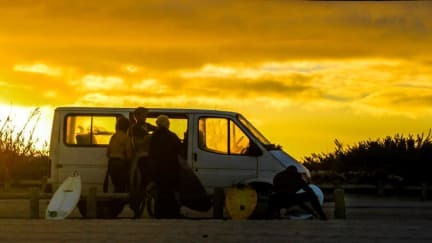 If you have questions about Peniche, the surroundings or surfing they take the time to help you. It was really fun to be part of their little family!